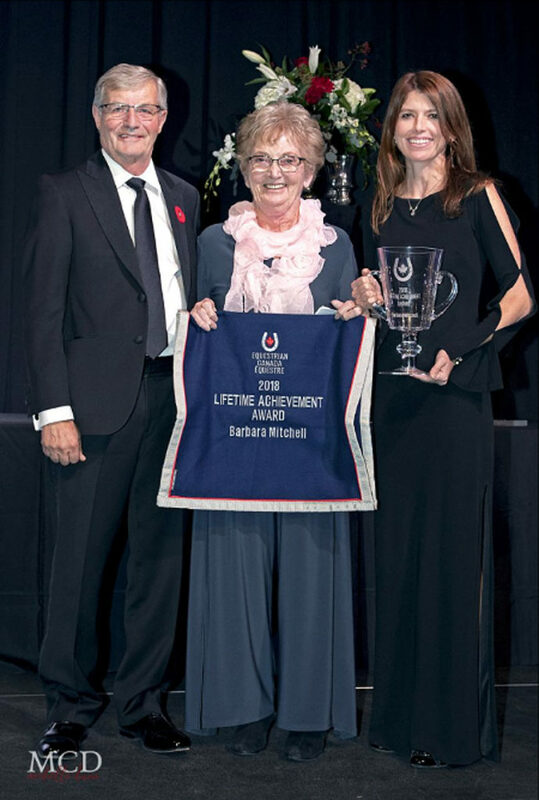 Barbara Mitchell of Mono, ON was honoured with the Equestrian Canada (EC) Lifetime Achievement Award for 2018 in recognition of her passion for and dedication to equestrianism, which in turn has hugely improved the quality, accessibility, and professionalism of the sport in Canada. From 1975 to 1993, Mitchell owned and operated Heritage Farms with Canadian Equestrian Team member, Danny Foster. They produced many winning grand prix horses together, including Forever Diamond, who won individual gold and team silver medals with Foster at the 1991 Pan American Games in Cuba. The next year, it was Heritage Farms’ Zeus who earned the distinction of being the leading Canadian horse at the Barcelona Olympics with Jennifer Foster. Mitchell’s next venture was CornerStone Farms, which she operated alongside her husband, FEI Level 3 Jumping Judge, John “JT” Taylor, until 2004. For 25 years, they made FEI-rated CDI dressage competitions available to the local community through the celebrated CornerStone Dressage at Caledon Equestrian Park in Palgrave, ON. The pair’s talent and proficiency in competition organization led them to be named to the dressage management team for the 2015 Toronto Pan American Games. A renowned judge and clinician, Mitchell’s skills are verified through countless accreditations. She is certified as an EC Senior Judge for hunter, hack and hunt seat equitation, and jumping. Mitchell also holds all of her judging cards with the United States Equestrian Federation (USEF). Furthermore, Mitchell is an EC certified High Performance 1 Coach for jumping. She coached many athletes who have gone on to incredible high performance careers, including Canadian Olympian Amy Millar in her junior years. EC’s coaching program has greatly benefited from her knowledge and expertise, as she was involved with the program since its inception and continues to lend her time as an evaluator. In addition, Mitchell has made a concerted effort to share her talents with the community at large through every step of her career. She is Past President and a former Director of the Ontario Hunter Jumper Association (OHJA), and currently sits on its Jumper Committee. She formerly sat on the EC Board of Directors, as well as Jump Canada (JC), where she also acted as Chair of the Athlete and Domestic Development Committee. Mitchell helped shape the future of Canada’s success on the world stage when she formed the Ontario Government Best Ever Program in 1985, a program that encourages and develops aspiring Canadian Show Jumping Team members and is now known as The Under 25 (U25) Series. With seeming ease, Mitchell has maintained an impeccable reputation while juggling multiple demanding roles over many years. In light of her efforts, she has been awarded the 2010 JC Volunteer of the Year Award, the 2000 Ontario Equestrian Millennium Award, and in 1991 was named Volunteer of the Year for Equestrian Sport by the Ontario Provincial Government. “I know of no one else that, for more than four decades, has willingly committed an immeasurable amount of volunteer time to all facets of equestrian sport in Canada,” said Craig Collins, a member of the EC Board of Directors. Mitchell has created countless opportunities, whether through competition or education, that have strengthened the foundation of equestrian sport in Canada. EC is pleased to honour her with the 2018 EC Lifetime Achievement Award.